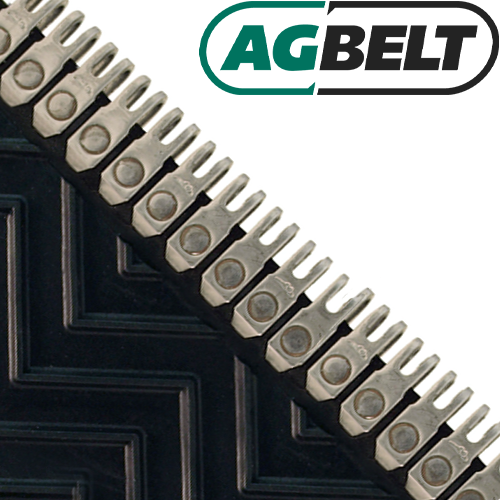 Description: AG Belt Continuous Chevron belts feature aggressive chevron-style ridges on the top cover that run continuously across belt width for superior gripping action. The Continuous Chevron is the ideal choice for many Hesston, Case, Gehl, Massey Ferguson, and New Idea round hay balers. The 3-ply technology provides for superior strength and fastener retention. The Alligator® Rivet Fastener system uses a patented, self-setting rivet technology that works the rivets between the carcass fibers without severing them. The fasteners and rivets are constructed from durable, abrasion resistant stainless steel for long life. All fasteners are professionally installed using production style equipment for a superior set and the connecting pin is included.